Have you ever started a card design and just wanted to keep the design super simple? Designing with White Space can give you a clean looking design that is pleasing to the eye. The thing is, it's not as easy as it looks. Today, Karolyn will guide you through some steps to help you achieve white space perfection. Watch the video below or click here (MFT October Release Class - CAS White Space) to watch it on YouTube. Don't forget to subscribe to our YouTube channel so that you don't miss a single tutorial! If you love the look of white space, check out the video HERE for more even more inspiration. Let's take a look at more examples of designing with white space! Barbara starts with a white card base, a white panel, and a white oval. All eyes are on the center of her lovely design and the rest of the card allows the focal point to shine. One of the keys to white space designs is allowing the eye to rest in your design. 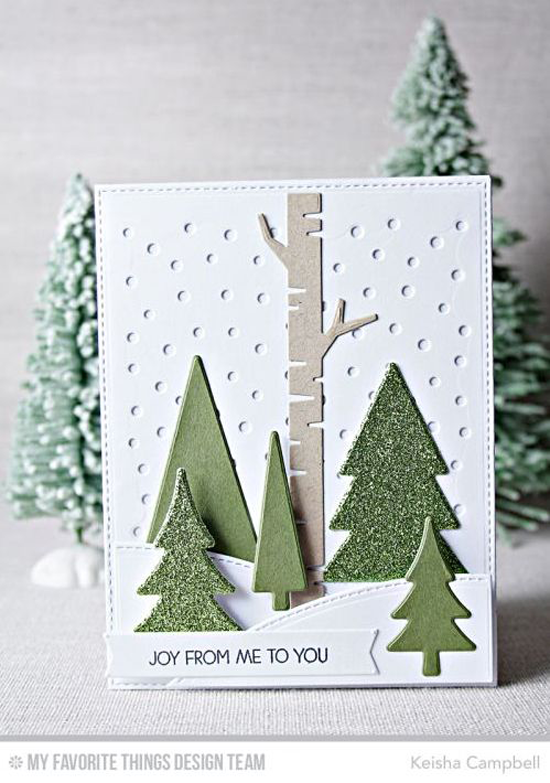 Keisha's card has a lot of depth, texture, and sparkle, but the white-on-white background has a certain quietness to it. It's like you can almost hear the silence of the snow falling in the woods. And white space doesn't have to be white! In Yoonsun's design, she started with a simple kraft background and focuses on the silly and festive llama in the center of her card. The red patterned paper at the bottom of the card base gives the design both weight and balance. You will LOVE trying your hand at using white space in your designs with products from My Favorite Things. Be sure to tag #mftstamps when you post your projects online. We can't wait to see what you've made! All three cards are amazing, as well as Karolyn's video!! Really enjoyed her tips and humor :) Thanks Karolyn!